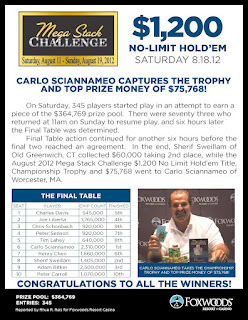 Carlo Sciannameo is the champion of the $1,200 Mega Stack Challenge Main Event. 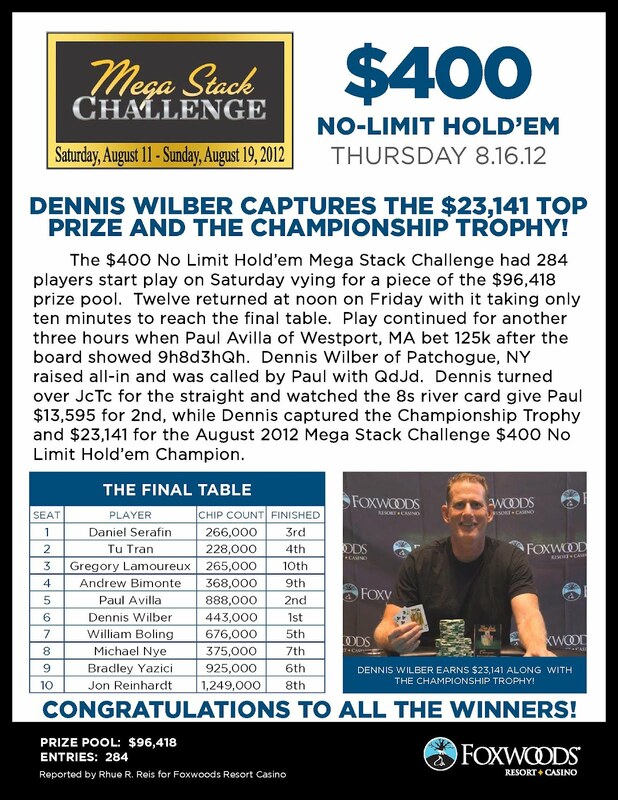 He takes home $75,768 and the Mega Stack Challenge Trophy! 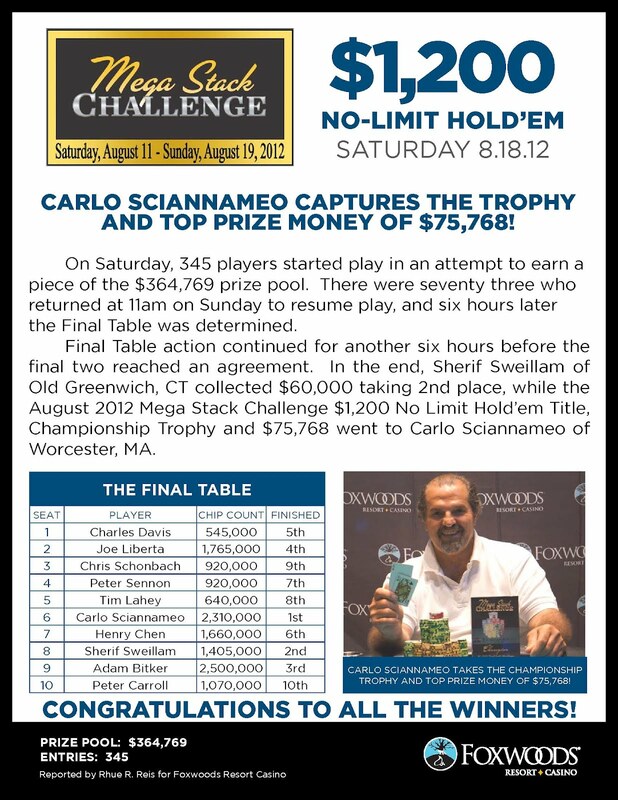 The board comes [Jh][3h][2h][Jc][4h] and Sciannameo wins the pot. Sweillam is eliminated in 2nd place and takes home $60,000 for his performance. Carlo Sciannameo and Sherif Sweillam have come to an agreement on a save. 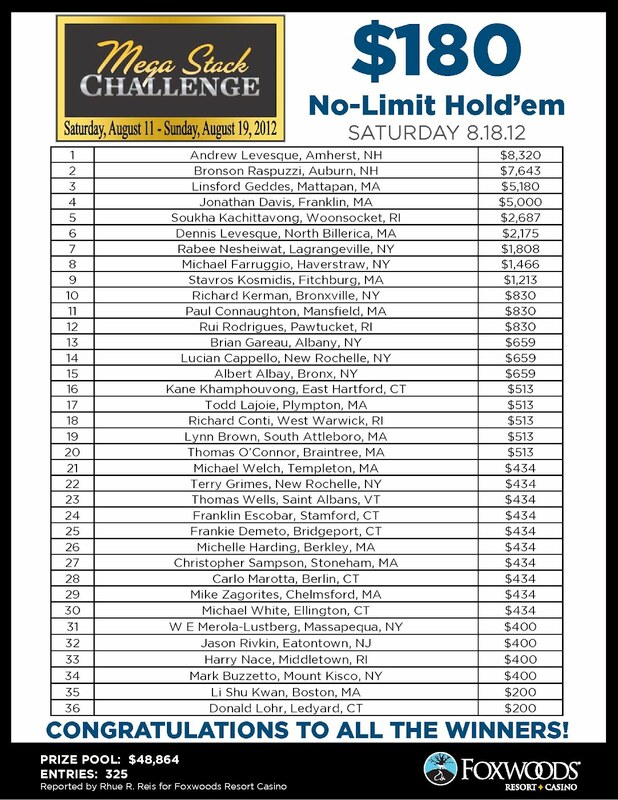 Sciannameo locks up $65,000 and Sweillam guarantees himself $60,000. 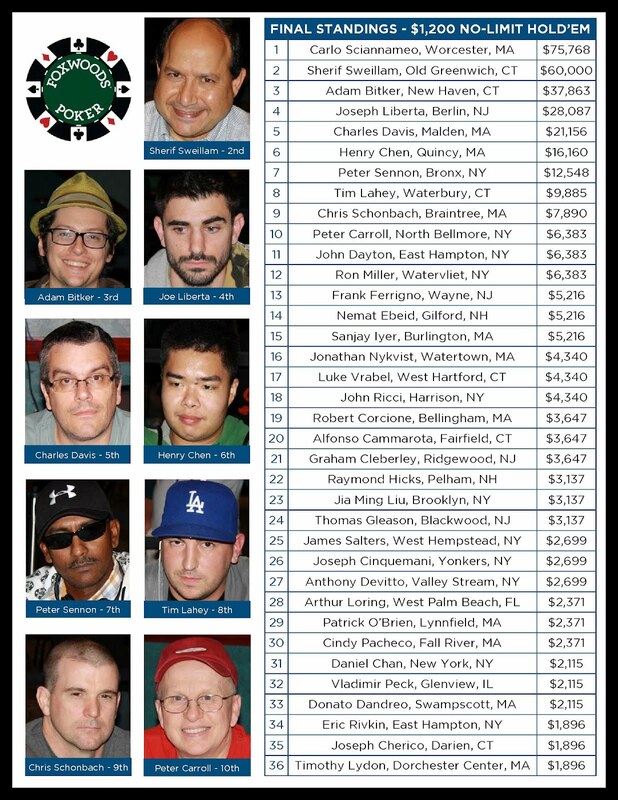 They are now playing it out for the additional $10,768 and the Mega Stack Trophy. The board runs out [Qs][6h][5c][4c][Qh] and Sweillam improves to trips. 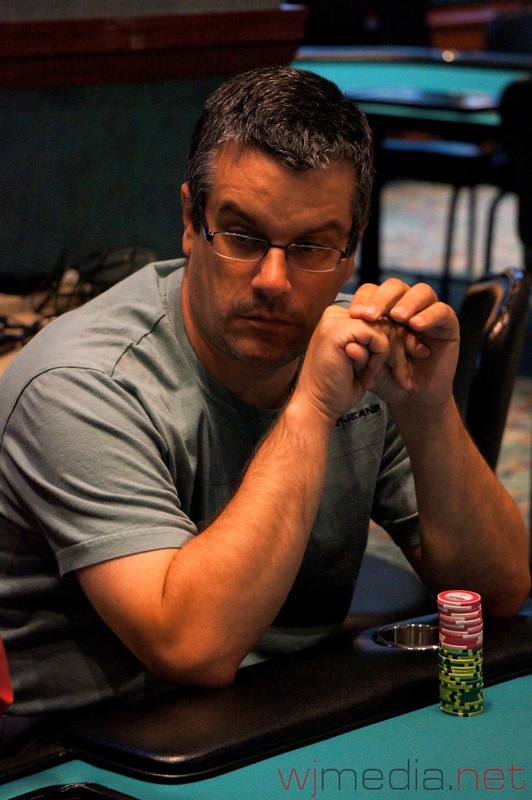 Bitker is eliminated in 3rd place and takes home $37,863. 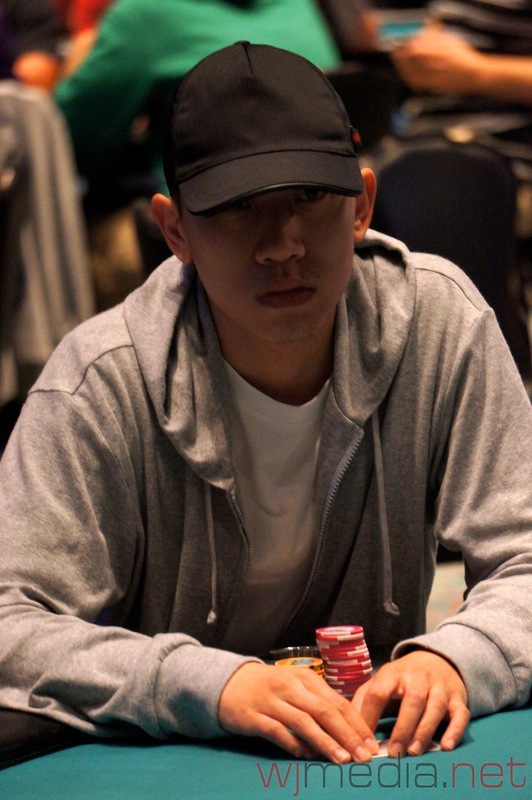 Daniel Chan looks to be the chip leader with only 95 players remaining. 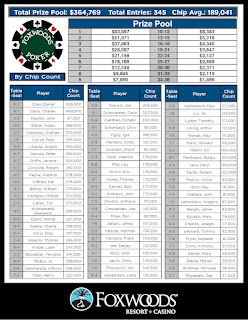 Chan has amassed a stack of well over 400,000 with the average at only 145,200. 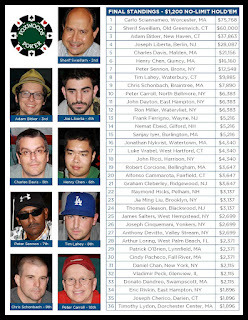 You can watch Chan in Seat 2 at the Live Stream Feature Table now by clicking on www.FoxwoodsLive.com. Out. Couldnt really get anything going. Not particularly happy with how I played after dinner. Oh well. Gl to friends still in! 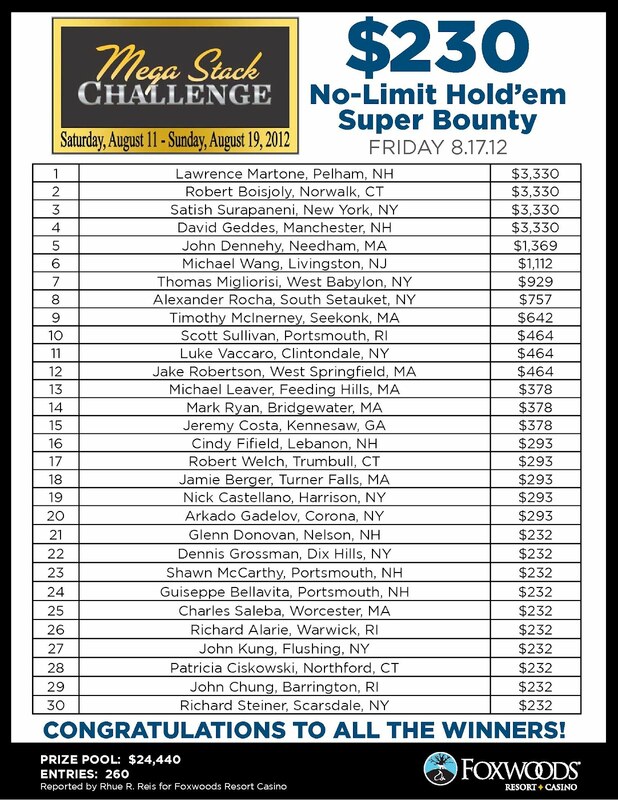 We are down to the final 100 players in the $1,200 Mega Stack Challenge Main Event of the 345 that started play. 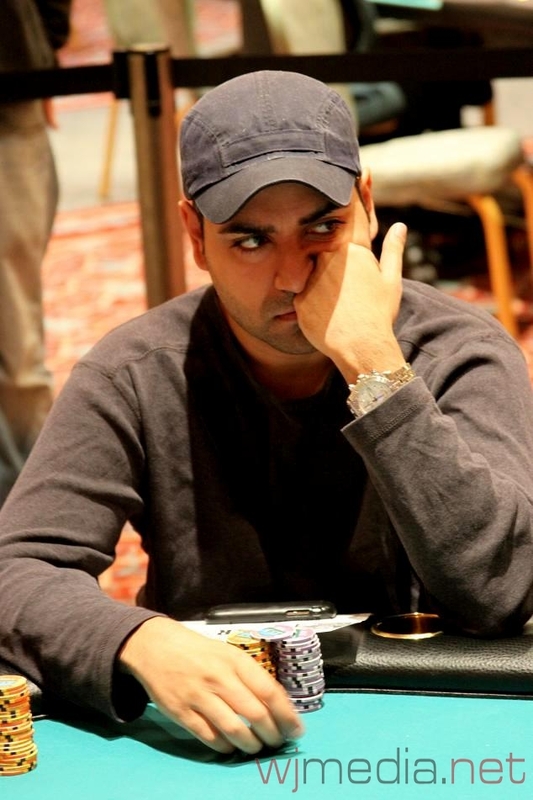 The blinds are now 2,000-4,000 with a 400 ante and the average chip stack is 138,000. After the completion of the current level, play is scheduled to continue for one more level on Day 1. 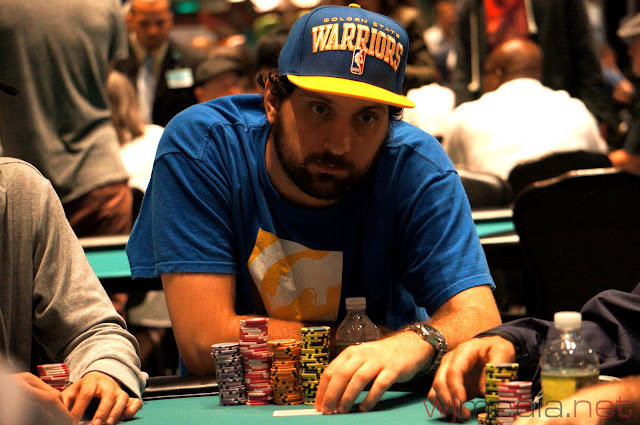 As you can see from his Tweet, Luke Vrabel is having a pretty good day at the table. 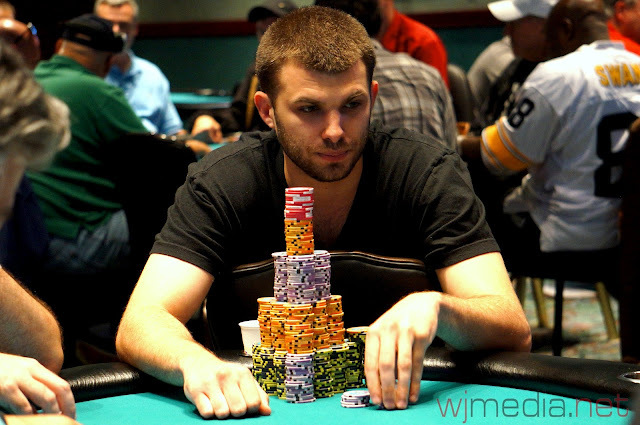 While we were posting this, Vrabel raked in another large pot to boost his stack to over 300,000. 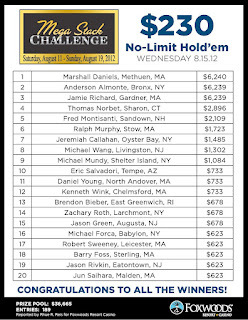 You can watch Vrabel live right now on the Live Stream Feature Table by clicking on www.FoxwoodsPoker.com. Busto @foxwoodspoker 1200 mega stack. Shoved my last 19k w ATo at 8/1600 and ran into QQ. GL to all my friends still grinding! 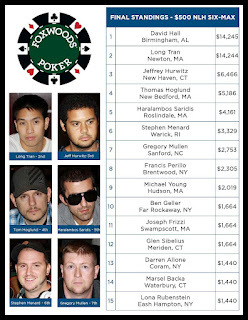 66.5k at dinner break of @foxwoodspoker main event. Players have just returned from their second break of the day and cards are back in the air. 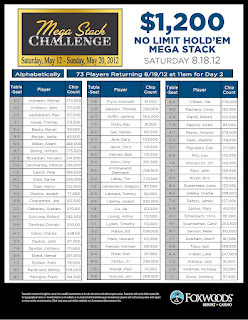 There are 225 remaining out of the 345 who started play today. 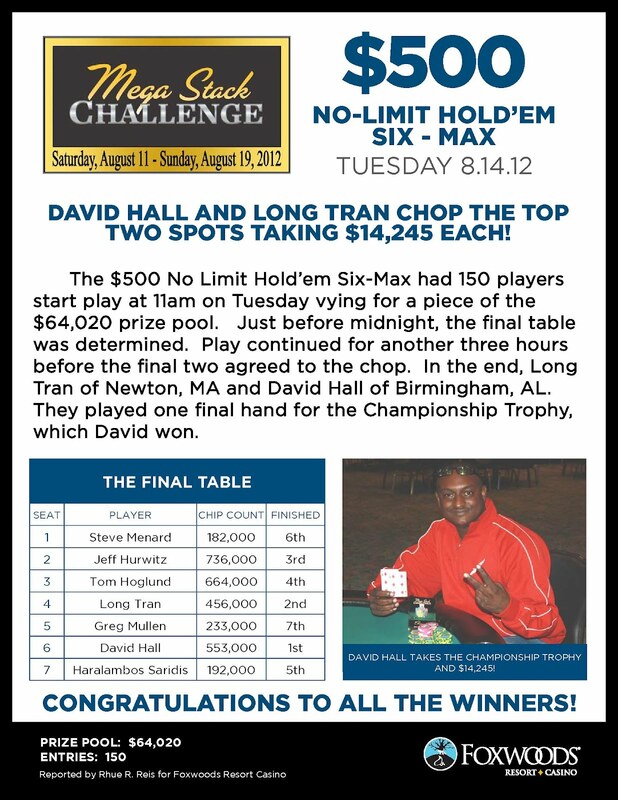 The blinds have been increased to 500-1,000 with a 100 ante and the average chip stack is now 61,300. 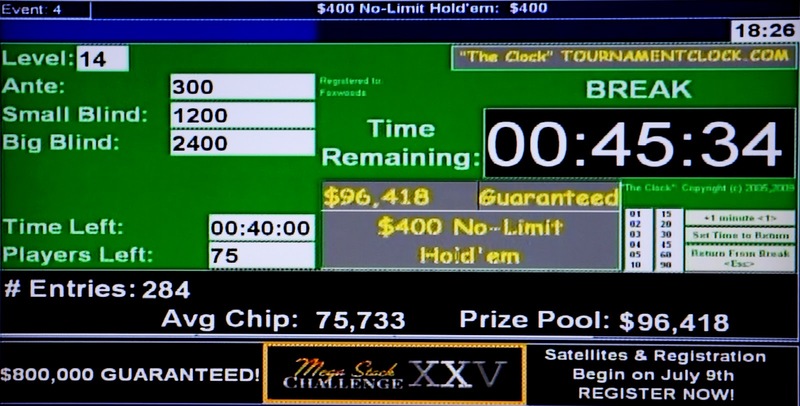 At the conclusion of this level, the players will take their dinner break. 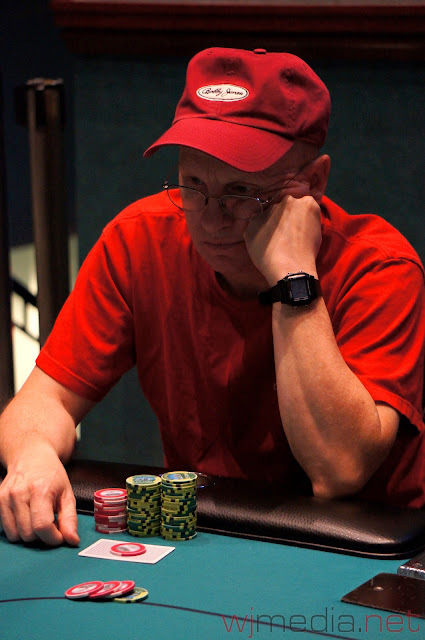 James Campbell is eliminated from the Mega Stack Main Event when his pocket aces fail to hold up against K-J on a board of K-5-2 when a jack hits the turn. 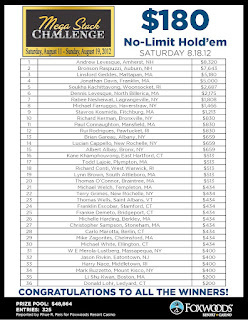 We had a total of 345 players in the $1,200 No-Limit Hold 'em Mega Stack Main Event. With registration open until approximately 1:10pm (at the conclusion of the first break), the board currently reads 329 players in today's field. 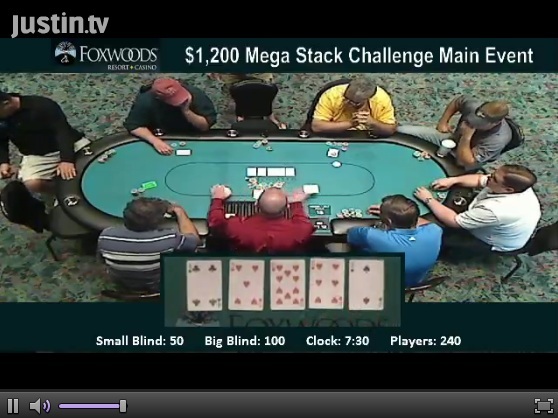 Mega Stack Main Event Now Streaming Live! You can now watch the live stream of the feature table of the $1,200 Mega Stack Challenge Main Event by clicking on www.FoxwoodsLive.com. 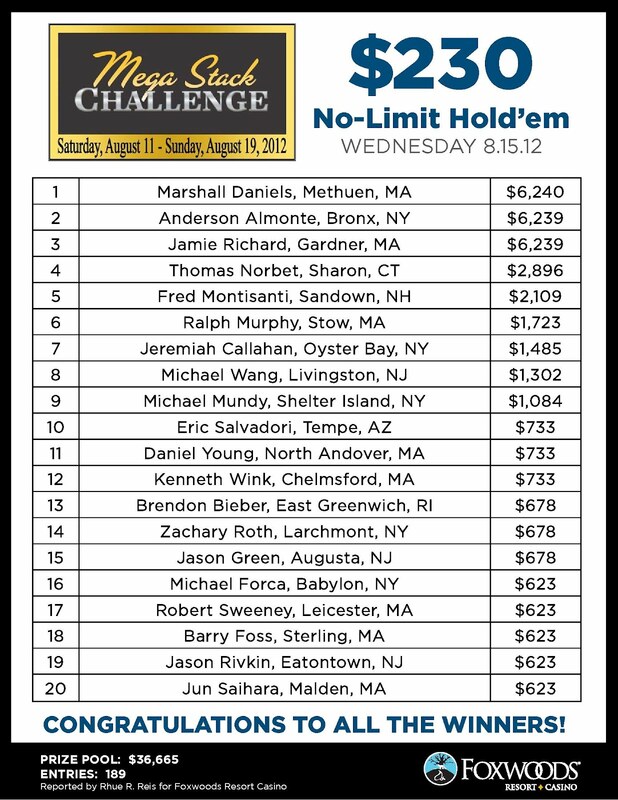 The $1,200 Mega Stack Challenge Main Event Underway! 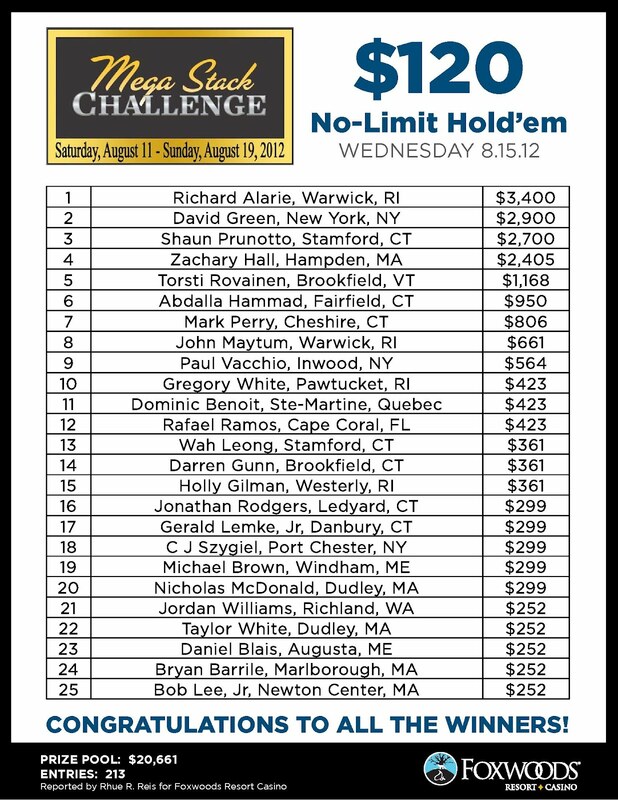 The $1,200 Mega Stack Challenge Main Event is now underway. The first 17 levels are 40 minutes in length with every level after that being 50 minutes. 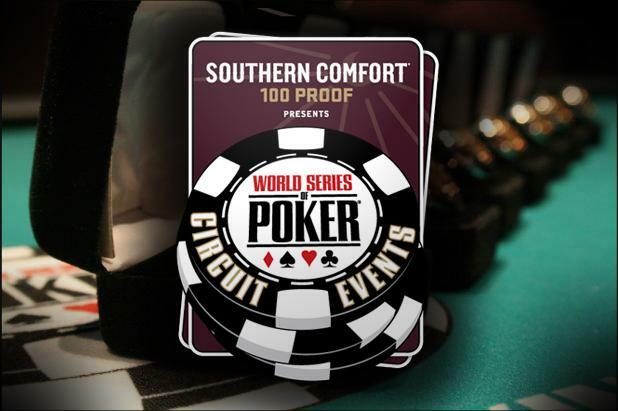 This event has a $200,000 guaranteed prize pool. 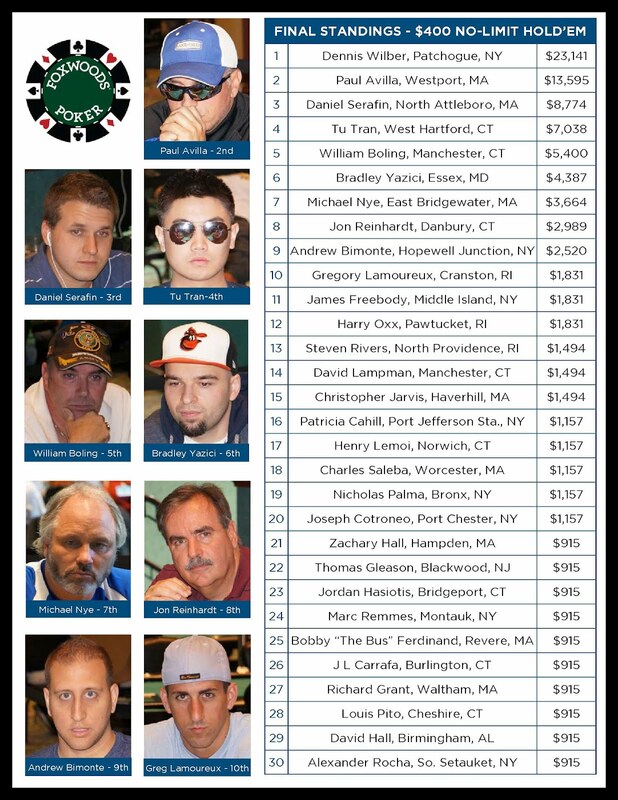 The live stream of the feature table will begin shortly. Congratulations to Dennis Wilber, winner of the $400 Mega Stack Challenge event. He takes home $23,141 and the Mega Stack Challenge Trophy for his victory. 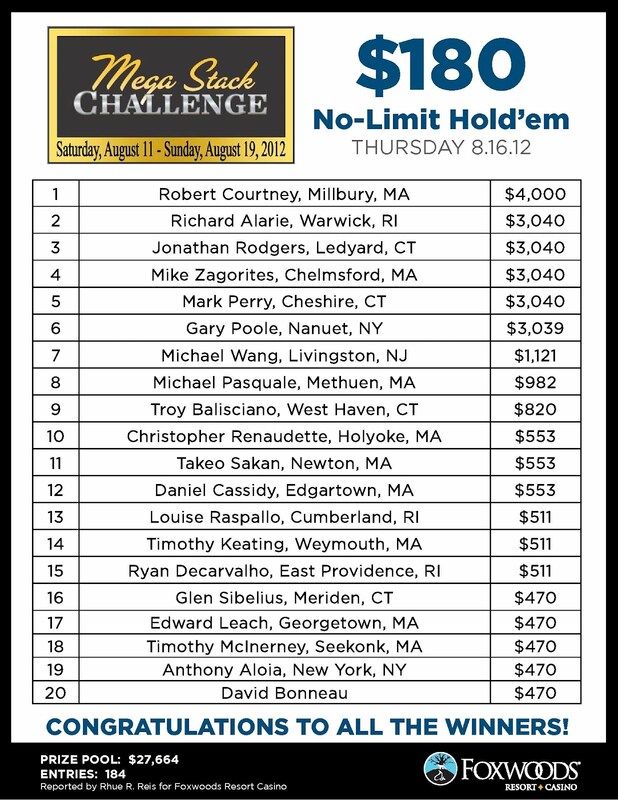 Be sure to join us tomorrow at 11am for the start of the $1,200 Mega Stack Challenge Main Event with a $200,000 guaranteed prize pool! Avilla has top pair but Wilber turns the straight. The [8s] falls on the river and Avilla is eliminated in 2nd place for $13,595. 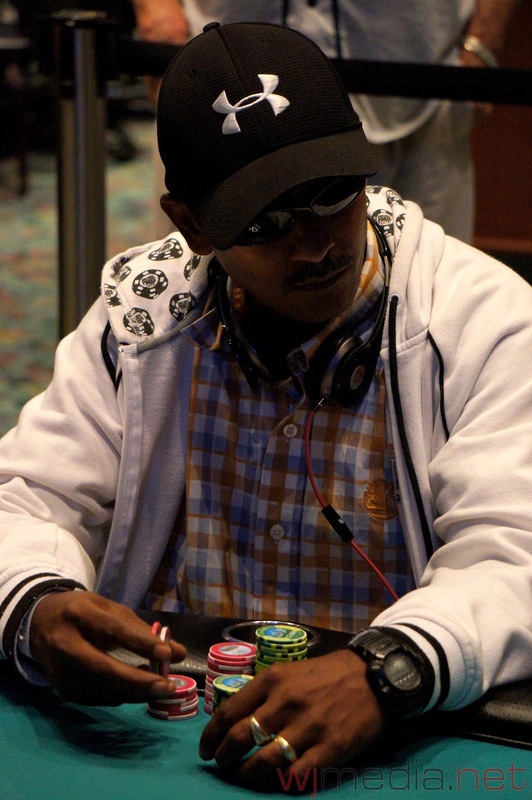 The board runs out [Js][2d][2s][5d][As] and Wilber improves to a full house to eliminate Serafin in 3rd place for $8,774. 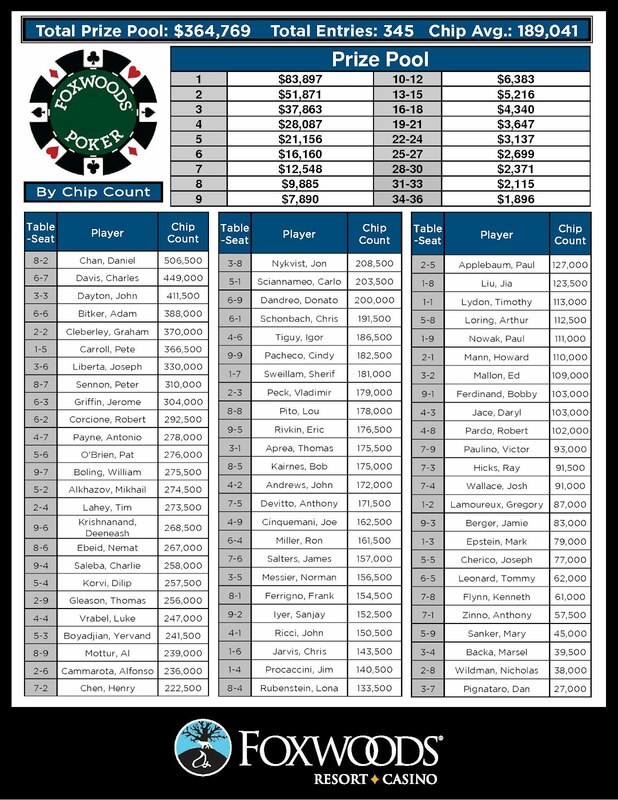 Tran holds a commanding lead until the board runs out [Ac][5d][3h][2s][4c], giving Serafin a six-high straight and the pot. Tran is eliminated in 4th place for $7,038. The board runs out [Td][3c][2h][4c][Ks] and Avilla spikes his king on the river to eliminate Boling in 5th place for $5,400. 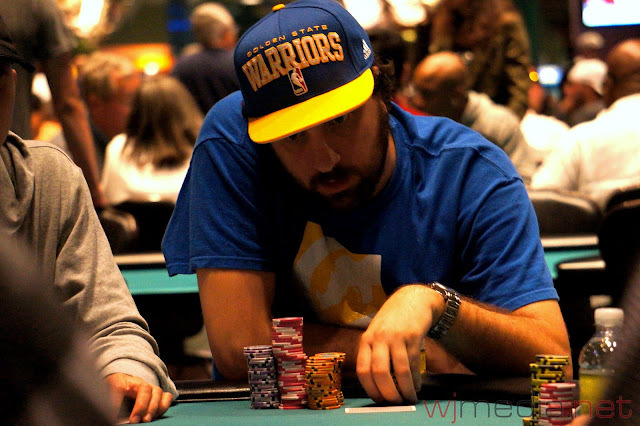 Bradley Yazici gets his last few chips in before the flop with [Jc][Jd] but runs in the [Ad][As] of Dennis Wilber. 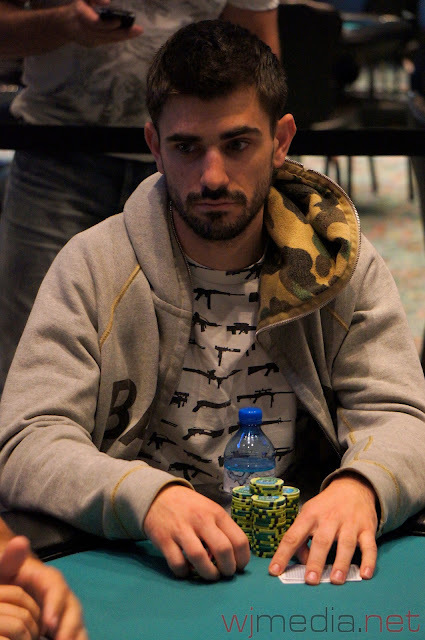 The board comes [Tc][9h][4h][4s][3c] and Yazici is eliminated in 6th place for $4,387. Daniel Serafin raises to 55,000 before the flop and is called by Tu Tran as well as Michael Nye in the big blind. Serafin flops the full house and Nye needs an eight or seven to win the pot. The turn is the [Jd] and the river comes the [Th]. Serafin wins the pot, eliminating Nye in 7th place for $3,664. The board runs out [Kd][Js][9c][5c][7c] and Reinhardt is eliminated in 8th place for $2,989. The flop comes [Jc][8d][3c], pairing Tran but leaving Yazici in the lead with his kings. However, the turn is the [Ac] and suddenly Yazici is in third place. The [6d] falls on the river. Tran triples up to over 600,000 by winning the main pot with his two pair. 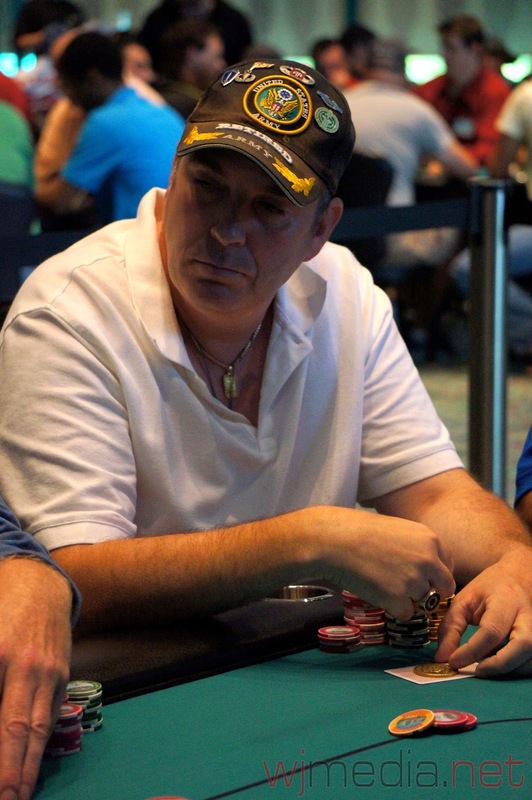 Serafin wins the massive side pot with his pair of aces to put him over 1,300,000. Yazici is left with just under 150,000. 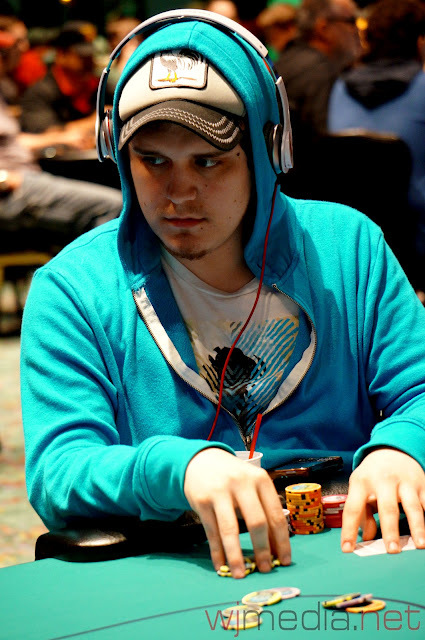 Shortly after being crippled when his A-K failed to hold up against A-Q, Andrew Bimonte gets all-in before the flop with [7d][6h] against the [8c][8h] of William Boling. The board runs out [Kc][Qh][9c][Jd][4d] and Boling's pocket eights hold up to eliminate Bimonte in 9th place for $2,520. The board runs out [8d][5c][2s][Ah][9c] and Serafin wins both the main and side pot with his pair of queens. 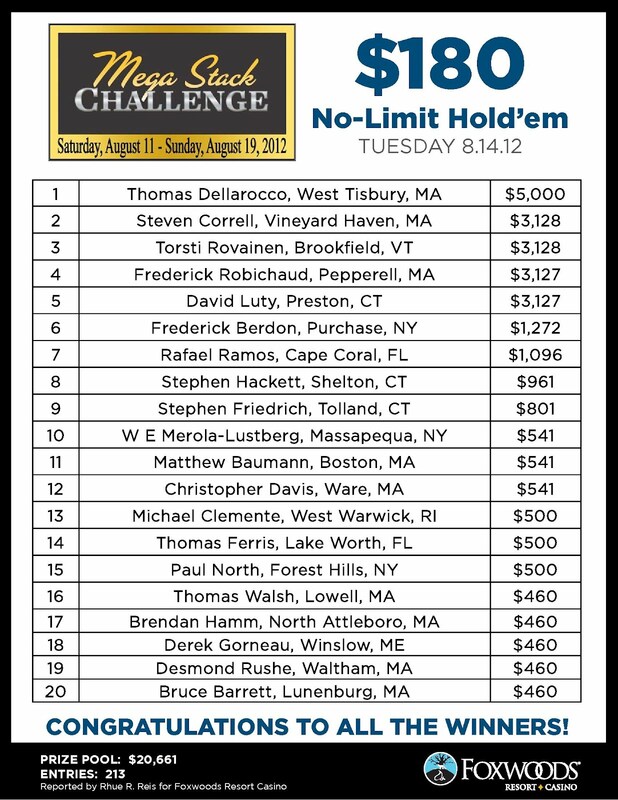 Lamoureux is eliminated in 10th place for $1,831. 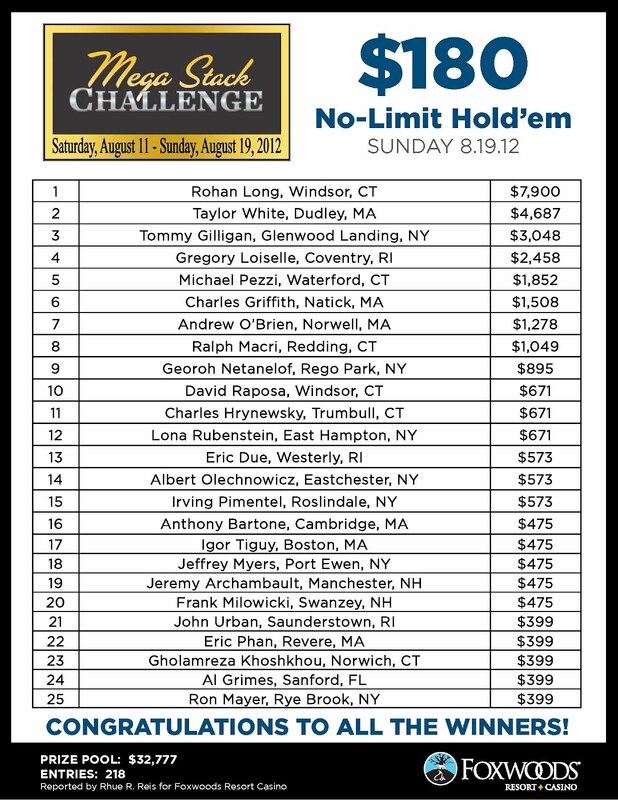 We have reached the final table of ten in the $400 Mega Stack Challenge. 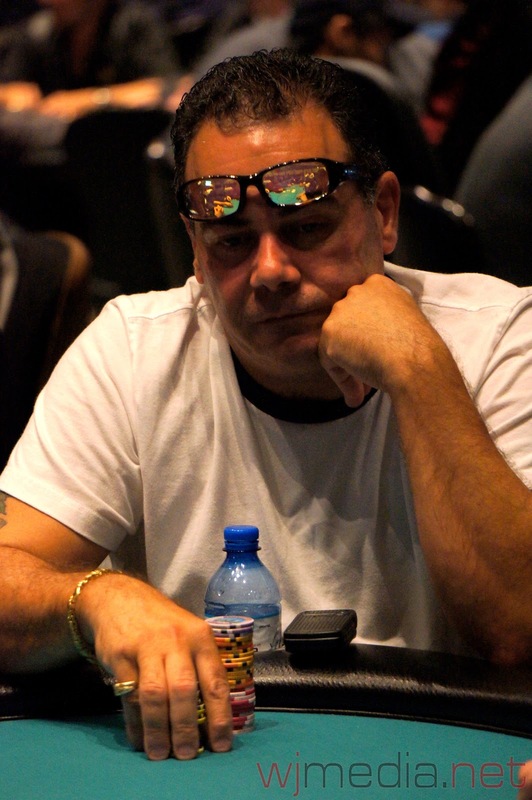 The blinds are currently 8,000-16,000 with a 2,000 ante for another 34:30. 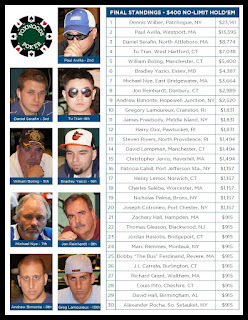 You can watch the live stream of the final table by clicking on www.FoxwoodsLive.com.